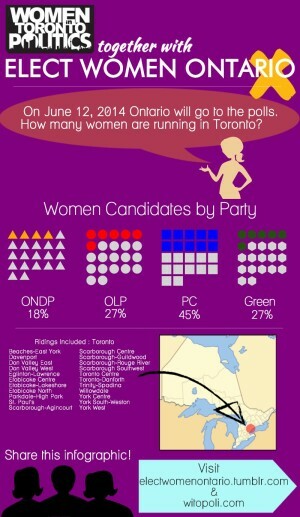 This Thursday Ontario voters are heading to the polls for the province’s 41st General Election. 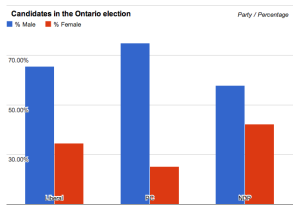 Of the three major parties, two are lead by women. At first glance, this looks like progress—women pushing their way into the old boys club that is politics. A closer look, however, reveals a less promising fact. “More than 87 per cent of Canadians are served by female provincial premiers, yet men outnumber women four to one in Canada’s federal Parliament,” writes as Emma Teitel in an October 2013 article for Maclean’s. “In this country, it seems, women rule from on high, but seldom from the middle, or below—a reality that puzzles political scientists and politicians alike.” The same article offers ideas as to why more women don’t enter politics, including: institutionalized sexism, the demands of motherhood, and old societal attitudes. Another factor, I’m sure, is how much opponents and media pick apart the look and personality of a woman who enters politics—forcing her into a “type.” (Take a look at our neighbours: Hillary Clinton is the big mean lesbian “type” and Sarah Palin is the ditzy girl next door “type,” right?) This tactic distracts from what the politician’s platform and values, much more so than is done for their male counterparts, often discouraging women to even try. By keeping women out of politics, we are creating a world that cannot be truly representative of the whole population—indeed, one that doesn’t seem truly democratic at all. Equal Voice is a group that describes itself as “a national, bilingual, multi-partisan organization dedicated to electing more women to all levels of political office in Canada.” As of July 2013, Equal Voice reports that Canada’s international ranking on women’s political representation is 46, meaning we are behind most of Europe, parts of Africa, and Australia. Early this year Lois Tuffin wrote How do you get more women involved in politics? for Peterborough This Week. YWCA executive director Lynn Zimmer, who helped put together a non-partisan workshop encouraging women to become more involved with politics told the paper that traditionally, a male politician relies on his spouse to take care of children and a female candidate would need that same level of support, which could happen if gender roles evolve, also adding that some women avoid running for office due to the combative nature of some legislatures, and opt for smaller roles instead. 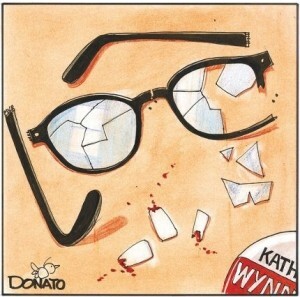 So though Ontario’s Liberal Party leader Kathleen Wynne and the province’s NDP leader Andrea Horwath may not be truly representative of the numbers of women in Canadian politics, let their symbolism serve as encouragement to progressively push forward.